For a collection of all the Bowie Restaurant Project entries, look here. It's a Burger King. On our way to pre-settlement inspection of our house, I was running late, hungry and driving right by here, so it made the perfect opportunity to try this place for review. I have made it my habit to order the chicken at Burger King, but since this was a review and, you know, the place was called Burger King, I got a Whopper. In awarding stars, I really only had one question. I have referred to Wendy's as "a cut above McDonald's" and awarded it two stars. Is Burger King in that category (main argument: hey, onion rings), or is a notch below that and deserving of only 1 1/2 stars? Well, this meal reminded me of why I always get the chicken at Burger King. I won't give you details of my body's reaction to the burger, but it re-affirmed my swearing off of Burger King burgers. That's good enough to knock BK down to 1 1/2 stars. 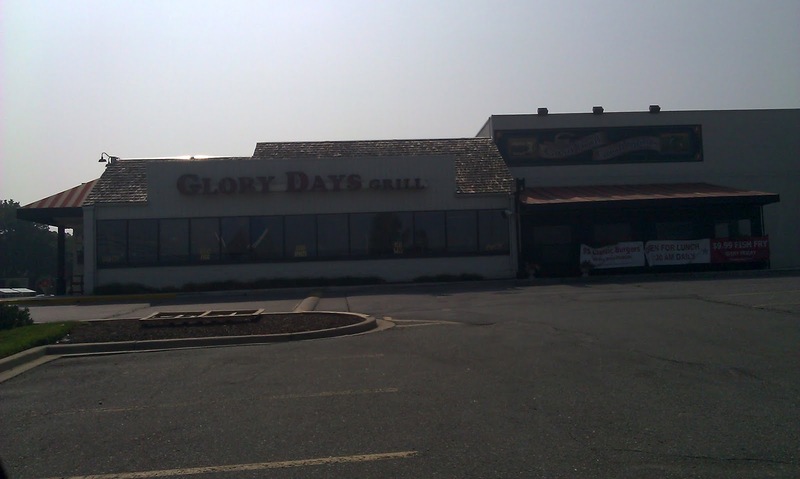 It is saved from 1 star by being the only Burger King in Bowie, and saved from below 1 star by offering a standard-order Burger King experience. Anything below my fairly low set of expectations (e.g., rude or incompetent service) would push things into that territory. Pre-Foursquare Visits: Apparently, since I had a menu from there in my office. 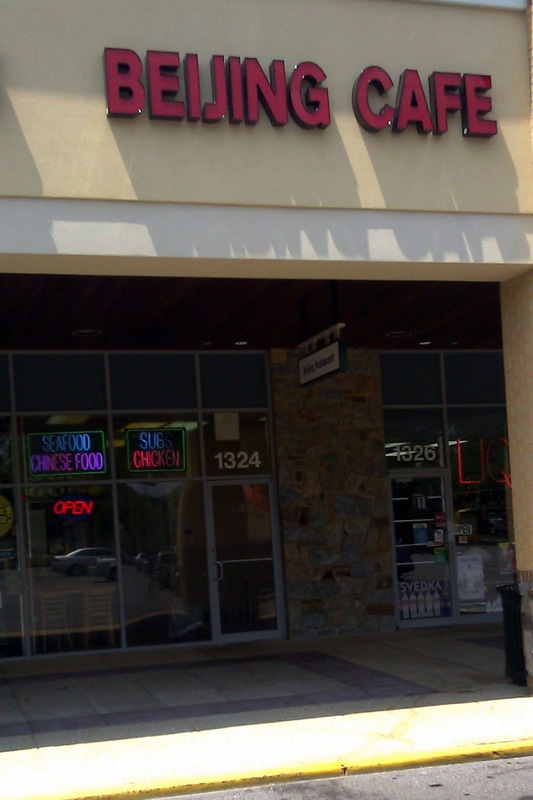 This is one of about 10 Chinese restaurants in Bowie. It qualifies as a restaurant because it has a few tables, but it seems to do mostly take-out business. Aside from being the southernmost Chinese restaurant in Bowie, this restaurant is completely inessential. I don't trust a restaurant that serves Chinese food and subs; it seems like it's trying to be too many things at once. I think I started doing takeout from a different place on Route 301 once I realized I didn't have to drive that far; my recent meal reminds me why. Not particularly tasty. At least it's not a chain. 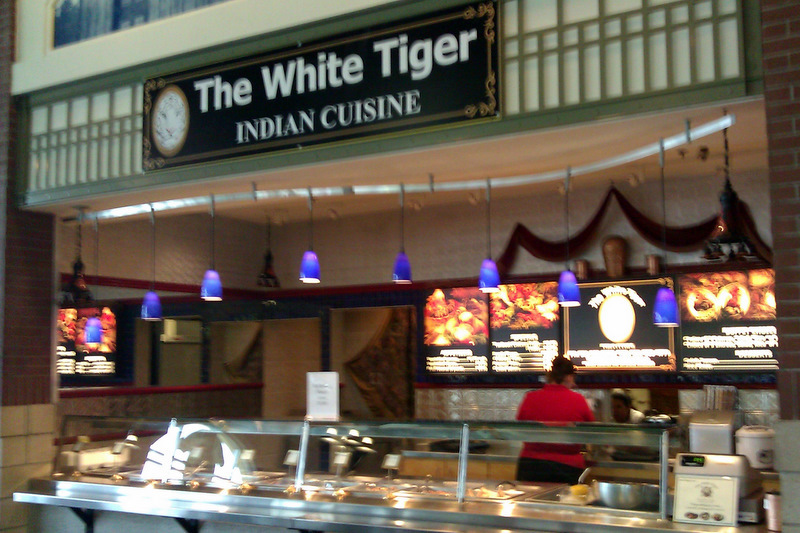 At least it's one of the few restaurants this far south in Bowie. That's about all I can say positive, and why it gets 1 1/2 stars. 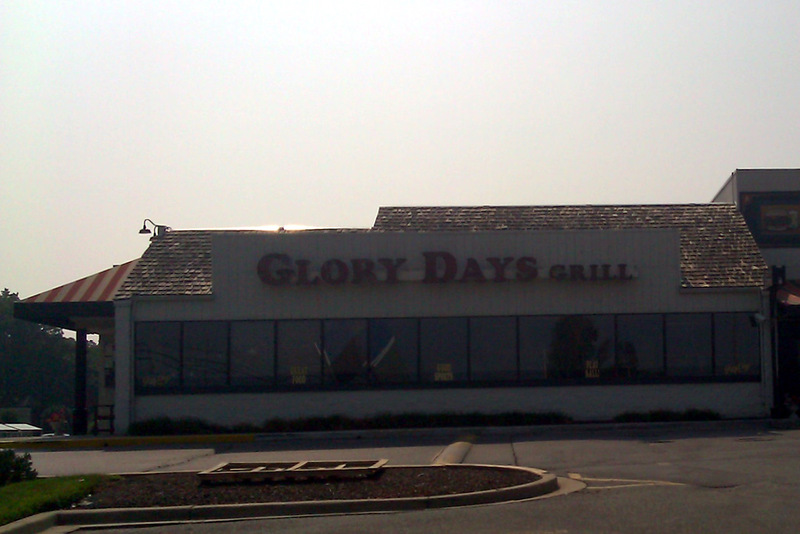 I have posted this restaurant as a waymark here. In Bowie restaurant news, Bowie Living reports that the "Bang Bang Mongolian Grill" will be opening this fall in the Free State Shopping Center. I probably won't review it until it makes it into the 2012 restaurant guide, but I will definitely review it, assuming the opening goes as planned. It'll be the first "Mongolian Grill" in Bowie, but the area is thick with Chinese restaurants -- two restaurants and a takeout place are within a stone's throw, another is just up the road at Hilltop Plaza, and a couple of others are within 10 minutes. It'll be interesting to see how it does. Ben's parents recently experienced a fire at their house. Luckily, nobody was injured, and though the house will need to be extensively renovated, it will not need to be completely torn down. 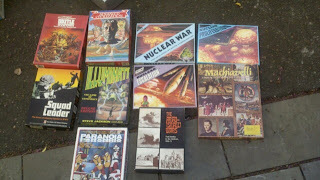 When emptying out the house for the renovations, they came across a box of games I had left there in 1994. I tell the story here, on the BoardGameGeek web site. It's a Five Guys. It's a burger chain that started out locally (in Arlington) and has expanded across the country. The menu is very limited, but the burgers and fries are a notch above what you find in a fast-food restaurant. Your food is cooked to order, but all of the burgers come out well-done. So it's not a gourmet experience, and it's not a unique experience (I find myself at the one in Gambrills more often, and there are at least 3 others in a 10 mile radius). As with many of Bowie's other chains, I can distinguish it from other franchises mostly by talking about the parking. Because it's in the mall, you can't pull up right outside and park like you can at my other Five Guys. If you're having one of their burgers, the walk will probably do you good, though. I set the bar at 2 stars with my review of Wendy's for a decent fast-food place where there's only one in Bowie. Since Five Guys is a bit above fast food, I'll bump it up to 2 1/2. It's another Subway. From what I read, it's a relatively new one. I stopped there on my way to see a house in the area -- one we ultimately decided against -- and had a fairly standard-issue Subway experience. The location of that house was a major factor in not buying, and while restaurant selection was not at the top of our list, I think the lack of choices in the area is pretty telling. Bowie is about 8 or 9 miles north to south, but in the southernmost 3 miles, you only have 5 restaurants -- this Subway, two Chinese places, a Pizza Hut, and a Domino's I recently decided doesn't count. 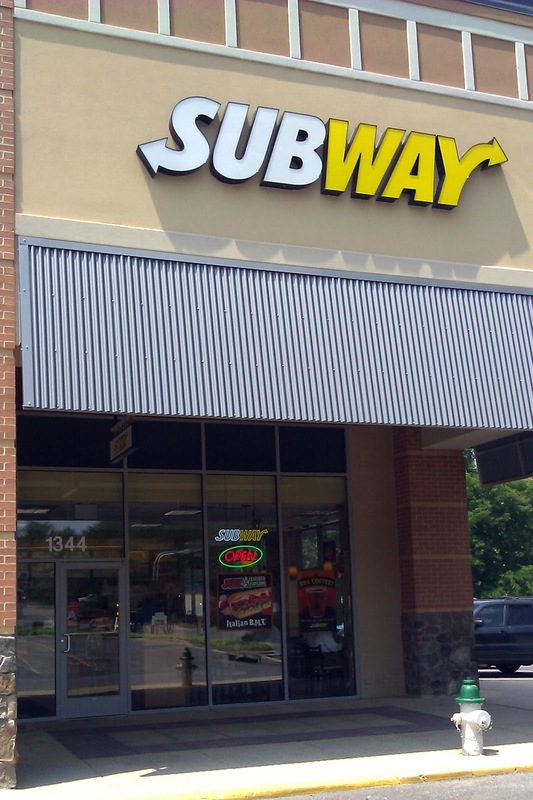 So given these facts: it's a standard Subway restaurant in a bleak part of Bowie for restaurants, how should it rate? Should it get extra credit for being one of the few choices "down south"? Or should it be penalized for contributing to the boringness of the choices? Let's say both, and give it the same 1 1/2 stars as the previously reviewed Subway. 2 Subways down, 5 to go. While this was perfectly adequate, given that it is the farthest Subway from our new house (and tied for the farthest restaurant), I don't see myself making a return trip. As a parent of twins, I don't have a lot of time for hobbies. 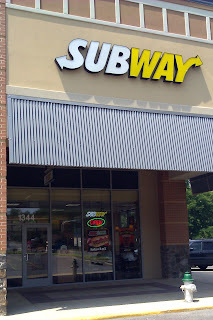 In the interests of efficiency, I decided to combine my restaurant reviewing hobby with my waymarking hobby by submitting this Subway as a waymark. I don't find the "Subway restaurants" to be the most exciting category, but it's pretty straightforward, especially now that I've enabled geotagging on my phone. Since I am taking these pictures anyway, I get the coordinates and the requisite picture.